Percussion instruments are definitely some of the most fun, and finding the best drum set can help you maximize that fun! We’ve researched and reviewed a range of different drum sets to help you choose the right option for you or as a gift, including junior-size, full-size, and electronic drums. But before you jump into our reviews of the best drum sets, check out these specs and features to consider while you compare different options. 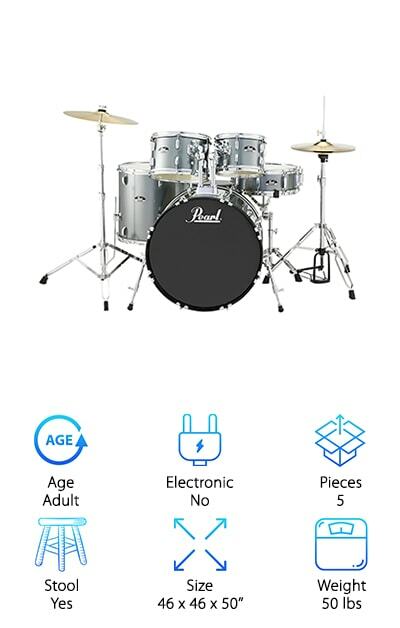 Age: Full-sized drum sets work best for adults or taller children 5’ and up, while junior sizes work for kids up to 8 years old. Electronic: An electronic drum set is a compact alternative to traditional drums that’s perfect for recording and mixing music. Pieces: A full drum set is five pieces, but smaller and larger sets are also available depending on your needs. Stool: Is a stool included? For absolute beginners or for giving a drum set as a gift, a stool can be a great feature. Size: If you don’t have unlimited space for a drum set, consider an electronic set or one with fewer pieces. Weight: Bigger, heavier sets are often built with materials of higher quality, but can be more expensive as a result. Now that you’re into the rhythm of drum set shopping, let’s check out some reviews. Our top pick and budget pick were the overall winners in our review process for price and quality, but read all ten drum set reviews to compare all of the options! Let’s get started! Gammon Percussion is one of the best drum set makers out there, so is it any wonder that this drum set is our top pick? Available in black, blue, red, or green, the real wood drums are professional-grade and dressed to impress. The set comes with a lug bass drum with pedal, a wood snare, two mounted toms with adjustable tilt memory locks, a floor tom, two hi-hat cymbals and a crash/ride cymbal. A stool, drumsticks, drum key, and instructional DVD are also included with the kit to help you get started. If you’re looking for the best drum set for intermediate to advanced players and for professional use, Gammon Percussion is a music industry leader and a great choice for your next drum set! This sturdy set is ideal for beginners to intermediate percussionists who want the best bang for their buck. Looking for a child-size drum set that won’t break the bank or take up a ton of space? 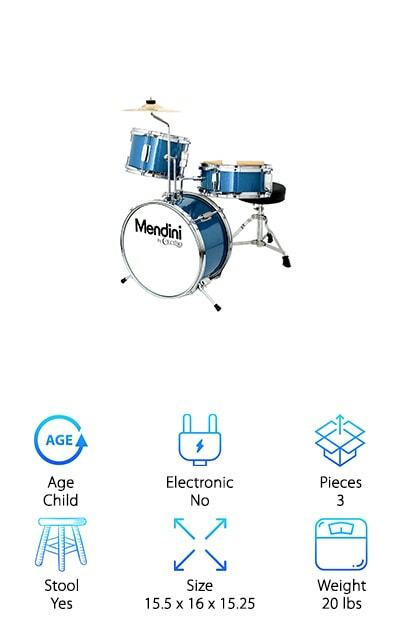 The Mendini Junior Drum Set is a compact three-piece set designed for kids 3-8 years old. It’s available in metallic blue, black, purple, green, and red finishes to customize it to any girl or boy. The set comes with a 13x8 bass drum with drum pedal, an 8x6 mounted tom, 10x4 mounted snare drum, and 8’’ cymbal with cymbal arm. A stool and wooden drumsticks are also included to get them started. The drums are made from genuine hardwood and triple-flanged hoops for a durable and high-quality feel. Set up is easier thanks to the compact mounting style that also saves you space. Customize it to your kid’s favorite color and get ready for a lot of banging noises! 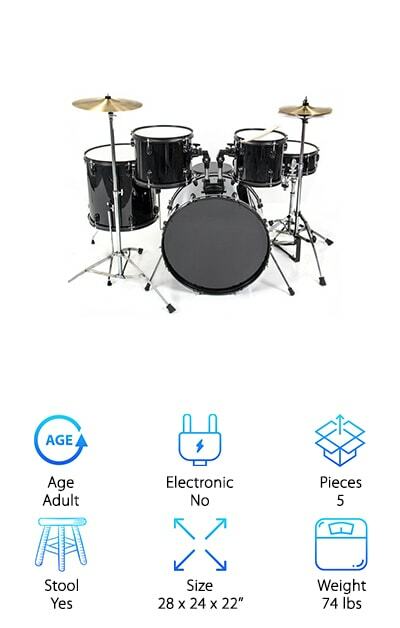 You get great quality for a great price with this junior drum set. The Nitro Electronic Drum Set from Alesis is our pick for the best electronic drum set. 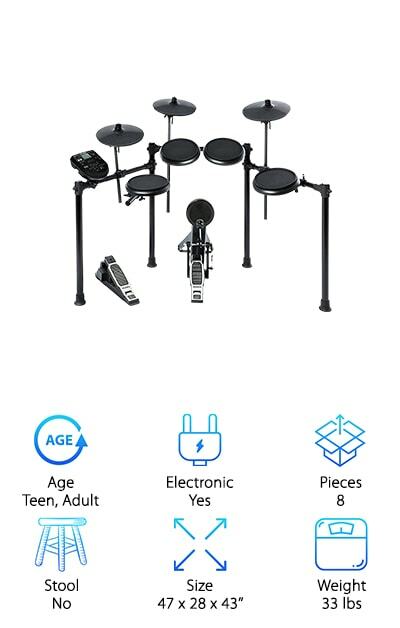 Electronic drum sets are ideal for people who want to record and mix their own music, and this set combines the look of a traditional drum set configuration with great technology. The set comes with a dual-zone snare, three single-zone toms, a kick pad, hi-hat cymbal, crash, and ride, all on a four-post aluminum mounting rack. The drum module features hundreds of percussion sounds--385, to be exact--plus 40 different kits and 60 built-in tracks you can play along to. Plug it into stereo speakers or a pair of headphones to practice. When it’s time to record, you can use the USB or MIDI options to connect to a computer. This responsive and dynamic drum set is perfect for beginner and intermediate recording artists, providing a great sound and feel for a great value. The Pearl Roadshow Series offers some amazing drum sets and configurations in unique colors and is definitely one of the best drum set options for intermediate to advanced drummers looking for a higher-end drum set on a budget. The Roadshow series is made from 9-ply 7mm poplar shells and covered wrap finish. It’s available in black, red, bronze, and charcoal metallic finishes so you can customize your set to your preferences. The New Fusion drum set comes with a bass drum with drum pedal, two toms, a floor tom, a snare drum, a brass crash-ride cymbal, and hybrid hi-hat cymbals. A stool and drumsticks are also included to get you started! The Roadshow Series also offers Rock, Fusion, and Jazz drum configurations to suit any musical genre. Whether they’re for playing in the school band or a rock concert, the Roadshow Series has a drum set for everyone! 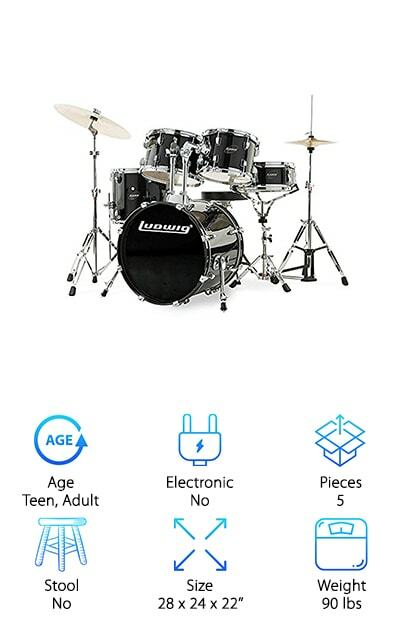 Designed for long-lasting use and easy replacement of worn parts, this full-size five-piece drum set is a great option for beginners with little to no percussion experience. The set includes a stool and drumsticks to get you started. The set comes with a snare, bass drum with pedal, two rack toms, a floor tom, a hi-hat cymbal, and a ride cymbal. The chrome-plated hardware and glossy black finish help you feel like a pro! It’s suitable for tweens, teens, and adults and is easy to expand on or upgrade as your skills grow. This is a great budget set if you’re just starting out, but check out our Pearl Roadshow drum set review if you’re looking for the best intermediate drum set. Made from solid wood and metal with chain-driven pedals, this all-in-one drum set is perfect for a first drum set and true beginners looking for all of the equipment they need to start drumming. 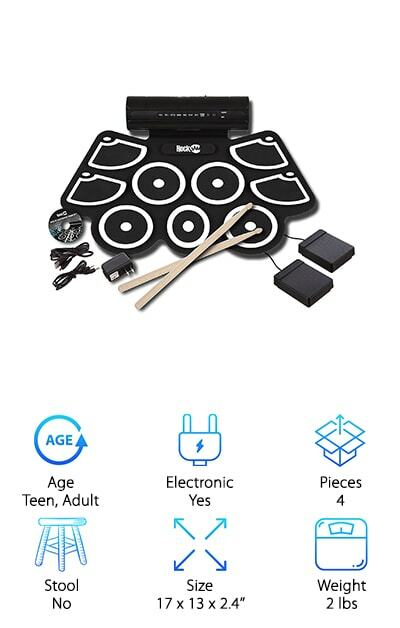 If you don’t have the space for a traditional drum set or want to experiment with recording your own music and beats, this tabletop drum kit from Pyle-Pro is a great choice. The tabletop design is compact for easy storage and transportation. Use the included AC adapter or play the drums wirelessly anywhere with six C batteries! A USB port lets you use it as a MIDI controller for recording music to a Mac or PC, plus you can edit and mix different beats with the drum kit using the LED control display and push-button options. The seven drum pads offer 25 preset drum kits and up to five custom drum kits with 215 different percussion voices and 128 GM voices. Wow! Play silently with the headphone jack or use the built-in speakers for a live performance. Two pedals and starter drumsticks are included, and it’s a lot easier to set up than traditional drum sets! The RockJam MIDI Drum Kit is the perfect compromise for kids and parents: kids and teens can rock out on the drums without disturbing neighbors and everyone else in the house! This electronic drum kit is set up on a thick pad that can be rolled up for easy storage and transportation. A headphone jack allows the player to listen to their beats, and a USB MIDI connection lets them upload beats to a computer or connect their phone to play along to their favorite songs. This electronic drum kit can grow with you thanks to these great tech-friendly features! The pad comes with two pedals, drumsticks, and a power supply, and the drum sounds include a crash cymbal, high tom, snare, open/closed high-hat, low floor tom, low-mid tom, and ride cymbal. 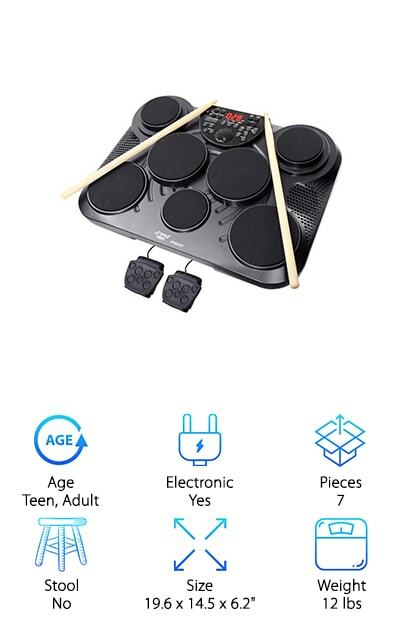 We think this is the best electronic drum set for kids on our list by a long shot. They can use the built-in speakers to put on a mini concert after plenty of quiet practice! 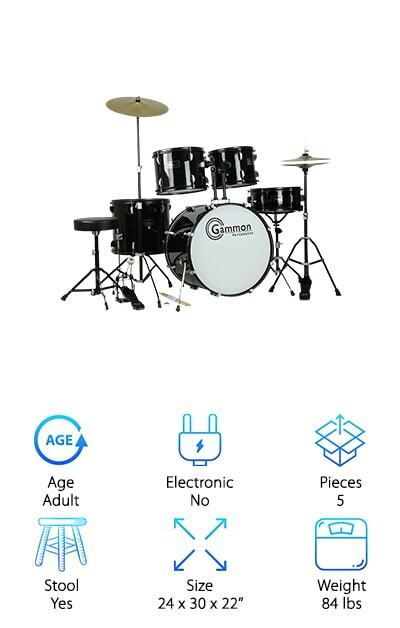 The Junior Drum Set from GP Percussion comes with a 10’’ cymbal and hi-hat, 16x11 bass drum with pedal, 10x6 tom-tom, and a 10x5 snare drum. Plus, a drum key, drumsticks, and stool are all included so your kid can get banging away ASAP! Pick a pair of noise-canceling headphones for everyone else in the house, and you’ll be all set! This kid-sized drum set has blue accents and synthetic drum heads rather than paper. The authentic construction similar to adult-sized drum sets helps these drums hold up to some serious beating! The set is sized for kids up to ten years old--taller ones may need a larger set. The included stool and drumsticks make this set a great gift for little ones who love rhythm and tempo. Take a step up from “disposable” kids’ drums and invest in a set that’s well-made but won’t break the bank! 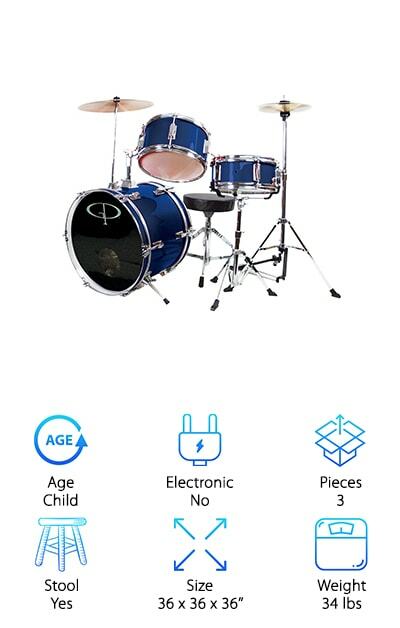 This snazzy blue three-piece drum set is sure to please the lucky kid who receives it! 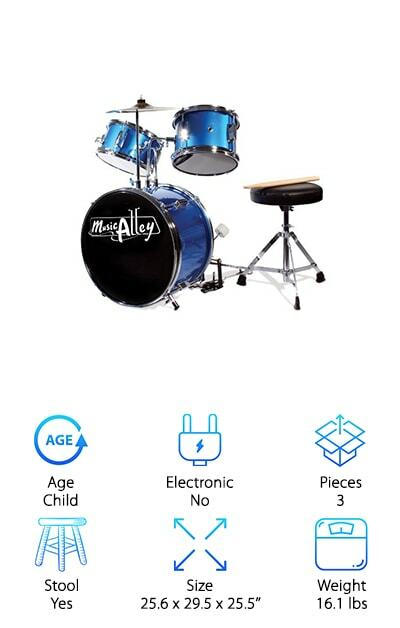 This three-piece small-size drum set is designed for kids ages 4-7 and includes an adjustable padded stool plus lightweight drumsticks. The set features a 14’’ bass drum with pedal, 8’’ snare drum, and 10’’ cymbal. It’s all made from real wood with chrome hardware to provide an authentic introduction to percussion. It’s made just like an adult drum kit but in a smaller size. Whether they’ve already fallen in love with the drums or want to try them out, this drum kit is a great way to explore percussion without breaking the bank. It’s one of our top choices for the best cheap drum set for kids since it’s really just a miniature adult drum set! The included stool and drumsticks make this an all-inclusive package that can be a great gift. This Ludwig drum set from the Accent Series is a five-piece set that includes hardware for setting up. This high-quality drum set is a good option for teens and adults looking to explore percussion with well-made drums that won’t break the bank. The set is made with a nine-ply Poplar shell and 45-degree inner accent with a slight outer bevel. The included pieces are a 16x22 bass drum, 6.5x14 snare drum, 12x9 tom, 10x8 floor tom, 16x16 floor tom, plus a 13’’ high hat and 16’’ crash cymbal duo. The throne and stands are double-braced and feature an improved chain-drive kick pedal, all wrapped up in a sleek black finish. You’ll have a stable, well-made drum set for cheap. If you’re looking for an all-inclusive starter kit or the best beginner drum set, Ludwig’s five-piece set will have you ready to go in no time!